Sneak peek from Issue 5: Motion: Mike Lowery doodles his answers to our Q & Artist interview. Who cannot absolutely adore Mike Lowery for his amazing doodles, hand-lettering, books, and inspiring-hilarious-addicting-to-watch #randomillustratedfacts? From Mike Lowery's Instagram feed, where he regularly shares videos of his sketchbook drawings featuring engaging and adorable random illustrated facts. Mike is a prolific children's book writer and illustrator who infuses his work with a sense of humor and child-like simplicity that never fails to amuse and delight us. His latest series with Workman Publishing, Doodle Adventures, invites kids to draw their own characters into the story and, page by page, the interactive book continues along via prompts for more illustrations by the reader. It's an ingenious format that combines drawing and doodling with the silly escapades of a wonky cast of characters that will keep everyone anticipating the next funny episode. By the end of the book, the reader will have helped to co-write a totally unique story that can be read over and over again with family and friends for a riotous good time. 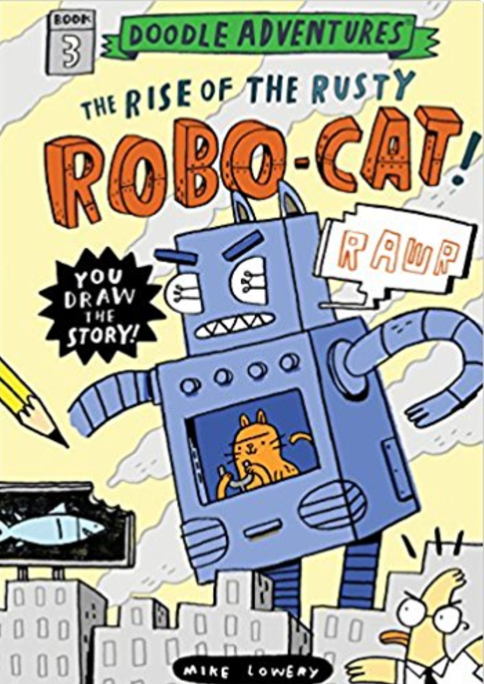 Thankfully with three books out (The Search for the Slimy Space Slugs!, The Pursuit of the Pesky Pizza Pirate!, The Rise of the Rusty Robo-Cat!) and counting in this series, your little doodlers will have enough to keep them creatively satisfied for some time. We are thrilled to share Mike's book trailer for this series, a series which has been described as "a visual Mad Libs: part game, part graphic novel, and a thrilling, interactive experience in which the reader draws him- or herself into the story and becomes the star." So much good! Yes! Roald Dahl books...we couldn't agree more. Art by Mike Lowery. See The Motion Issue for the full Q & Artist feature! Don't miss out on Mike's awesome books and make sure to get a copy of The Motion Issue to learn more about what inspires Mike, what he's currently up to, and when he feels his most creative. And be sure to enter our GIVEAWAY in partnership with Workman Publishing between now and Friday, 9/15/17, for a chance to win a set of Mike's Doodle Adventures books. Head to our Instagram feed for contest details.